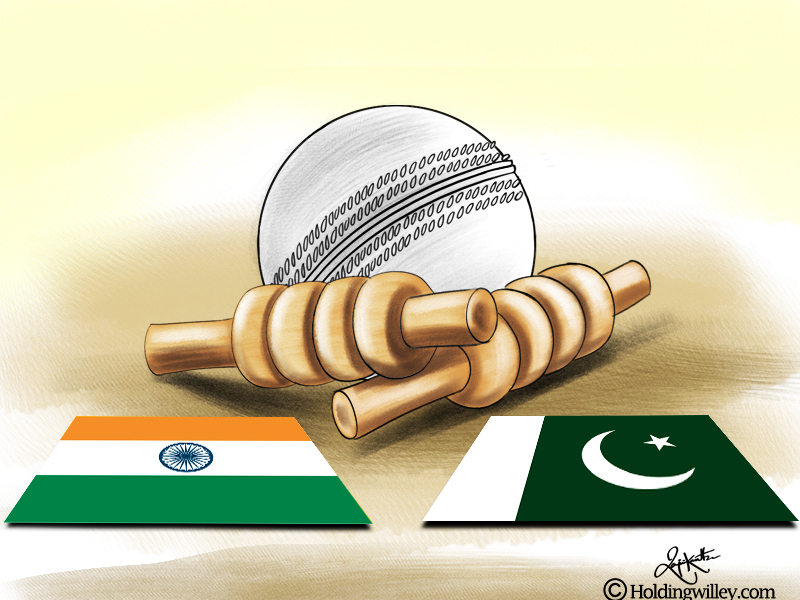 A game of cricket between India and Pakistan is the mother of all battles. Whenever the two neighbours compete, life in these two countries almost comes to a standstill with everyone glued to their television sets. In the 1990s, Pakistan was clearly the superior team, while India have had the better of the exchanges in ICC events. Overall, the teams have competed in 131 ODIs, with India winning 54, losing 73 and 4 ending in a no-result. Pakistan have won more ODIs than India at home, away and neutral venues. Since 1st January 2000, India have won 27 ODIs and Pakistan have won 26. Below, we look back at 4 exciting ODIs between the two teams. Pakistan won the toss and elected to field. Prior to this match, the teams had played just 3 ODIs at Sharjah and India had won 2 and lost 1. Pakistan had yet to establish their superiority over India in ODIs, particularly at Sharjah. Krishnamachari Srikkanth blazed away in typical fashion to get India off to a flier. Sunil Gavaskar also scored at a faster rate than usual as the Indian openers put on 117 for the first wicket before Srikkanth was dismissed, caught by Wasim Akram off the bowling of Abdul Qadir for 75. Dilip Vengsarkar carried on the good work of the openers and scored 50 off just 64 deliveries. At one stage, India looked set for a total of around 275, which would have been impossible to chase in those days. However, there was a sudden collapse as India’s batsmen gave in to the pace of Wasim Akram and Imran Khan. India finished at 245/7 off their 50 overs, which was still a formidable total in 1986. During Pakistan’s reply, India kept picking up wickets at regular intervals but for stubborn resistance from Javed Miandad. He almost played a lone hand from one end and apart from him no other Pakistani batsman even scored a fifty. Miandad was lucky to survive a leg before appeal off the very first ball he faced but after that played confidently to get Pakistan closer to the target. Qadir scored a quickfire 34 off 39 balls before he perished. Imran Khan and Manzoor Elahi both fell in single digits and Pakistan needed 11 runs off the last over with 3 wickets in hand. Kapil Dev made the cardinal sin of not switching ends and bowling the 50th over himself, and the onus fell on Chetan Sharma. Akram sacrificed his wicket by going for a non-existent 2nd run so that Miandad could remain on strike. The equation came down to 5 off 3 when Zulqarnain was bowled. Mohammad Azharuddin missed a simple run out off the penultimate ball which would have ensured India’s victory. Pakistan needed 4 off the last ball and Chetan Sharma tried to bowl a Yorker, which ended up as a juicy full-toss which Miandad struck for a six to propel Pakistan to victory. Miandad was the Man of the Match and this match left a lasting scar on the minds of the Indian players. Over the next 14 years, India won just 4 and lost 16 of the next 20 ODIs against their arch rivals at Sharjah. India won the toss and elected to bat. Navjot Sidhu and Sachin Tendulkar got India off to a steady start putting on 90 for the first wicket before Tendulkar was dismissed. The Indian innings lost momentum, but Azharuddin and Vinod Kambli played quick cameos to add impetus to the innings. Sidhu was particularly severe on the spinners and scored a valiant 93 before he was bowled by Mushtaq Ahmed. India looked set for a total of around 260 when Ajay Jadeja played the innings of his life. India took 51 runs off the last 3 overs. Waqar Younis conceded 40 off his last 2 overs as Jadeja repeatedly found the boundary. India finished with a formidable 287/8 off their 50 overs. Saeed Anwar and Aamer Sohail got Pakistan off to an electrifying start, amassing 84 for the 1st wicket before Anwar was caught by Anil Kumble off Javagal Srinath. Pakistan suffered a mini-collapse and were reduced to 132/4. Their two most experienced batsmen, Javed Miandad and Saleem Malik, were at the crease but the asking run rate kept climbing as the runs came only at a trickle. For once, Miandad was found wanting as he struggled to force the pace. Pakistan needed 92 off the last 10 overs but after Rashid Latif was stumped by Nayan Mongia off the bowling of Venkatapathy Raju, the match was firmly in India’s grasp. Miandad was soon run out and Pakistan just resorted to playing out their 49 overs (1 over was reduced due to a slow over rate) without being bowled out. Sidhu was adjudged the Man of the Match. Pakistan won the match and elected to bat first. Saeed Anwar played in typical belligerent fashion without getting much support from the other end while Inzamam-ul-Haq was comically run out. Anwar struck a magnificent century and the finishing kick to the innings was provided by Rashid Latif and Wasim Akram. Anwar was bowled by Nehra for 101, with 7 fours, as Pakistan scored 273/7 off their 50 overs. Before the advent of T20s, in the cauldron of a World Cup game, this was quite a daunting target. In reply, Virender Sehwag and Sachin Tendulkar launched such a blistering assault in the first 5 overs that Pakistan’s bowlers never recovered from their brutal onslaught. India reached 53 for no loss in the 6th over when Sehwag was caught by Shahid Afridi off Waqar Younis. Sourav Ganguly was LBW off the very next ball for a duck to give Pakistan a glimmer of hope. However, this was Tendulkar’s day and he was not to be denied. He fashioned a century partnership for the 3rd wicket with Mohammad Kaif, taking India to a position of supremacy. He was dismissed for 98 off 75 balls by a brute of a delivery from Shoaib Akhtar, caught by Younis Khan trying to fend it off. India was so far ahead of the required run rate that they could afford to take their time. Rahul Dravid and Yuvraj Singh played calmly and sensibly to take India to a 6-wicket victory with 26 balls to spare. Tendulkar was adjudged the Man of the Match. Most spectators and fans prefer to see run fests but this was a low scoring encounter that had everyone on the edge of their seats. India won the toss and decided to bat. They were soon tottering at 37/3 as Mohammad Irfan and Junaid Khan ripped apart India’s top order. That soon became 63/4 and Suresh Raina and Mahendra Singh Dhoni were forced to play uncharacteristically slow innings to try and ensure that India batted their allotted quota of 50 overs. Dhoni and Raina scored 36 and 31 respectively and Ravindra Jadeja showed his versatility, facing 39 balls for his 27 before Saeed Ajmal cleaned up India’s tail, taking 5/24 off 9.4 overs as India were bowled out for 167 off 43.4 overs. Pakistan could afford to take their time as the target wasn’t very high. They were coasting at 113/3 when Misbah-ul-Haq was caught by Ajinkya Rahane off the bowling of Ravichandran Ashwin. There was a sudden flurry of wickets as Shoaib Malik and Umar Akmal fell cheaply. The equation came down to 24 off 23 balls with 4 wickets in hand. 3 wickets fell for the addition of just one run as the equation now became 23 off 15 with just one wicket in hand. Suddenly, India were in the driver’s seat. Mohammad Hafeez and Irfan added 10 runs before Hafeez was caught by Yuvraj Singh off Ishant Sharma’s bowling for 21. India had won a nail-biter by 10 runs. Dhoni was declared the Man of the Match.